Striking postal workers outside Sackville’s post office on Main St.
Members of the Canadian Union of Postal Workers (CUPW) set up a picket line today outside the main post office in Sackville. 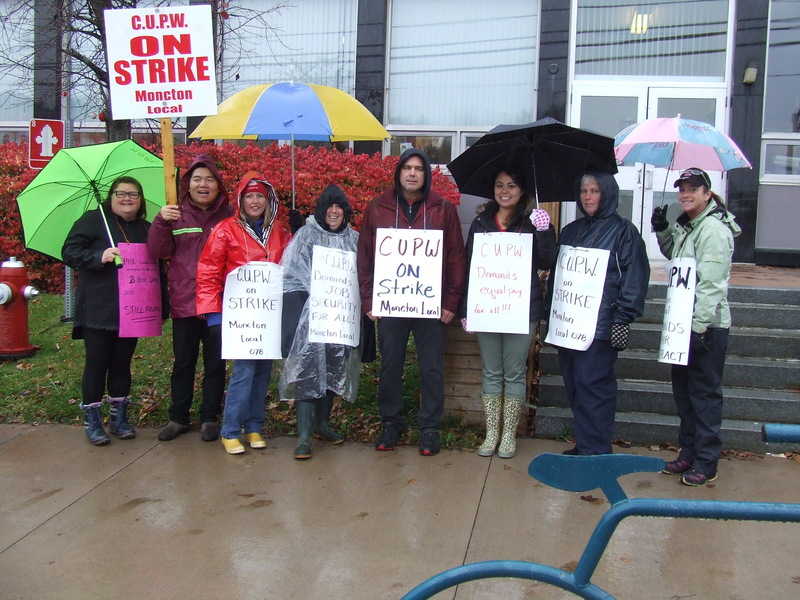 The postal workers are members of the CUPW Moncton local which began a rotating strike at 6 p.m. yesterday, one of several across the country. The rotating strikes are happening as Canada Post and CUPW try to negotiate new contracts for the union’s two bargaining groups with the help of a special mediator appointed by the federal government. The Urban Postal Operations and Rural and Suburban Mail Carriers (RSMC) bargaining units have been without a contract for almost a year. Linda Campbell, president of CUPW’s Moncton local, says excessive overtime and health and safety are two of the main issues. Campbell explains that postal workers are routinely expected to work overtime. CUPW accuses Canada Post management of refusing to deal with safety issues that arise from excessive workloads and overtime. Campbell adds that a third main issue involves pay disparities between different groups of workers. “They’ve gone with a two-tier system for new hirees, temporary workers, so they’re paying them much less than their co-workers, but they’re doing the exact same job and all of our people who do the rural mail service, they do the exact same job as a letter carrier, but make less money,” she says. In a statement e-mailed to The New Wark Times, Canada Post says it’s working to address the union’s concerns. “The Corporation has made significant offers to CUPW that include increased wages, job security, and improved benefits, and it has not asked for any concessions in return,” the statement says. Meantime, CUPW Moncton’s local president Linda Campbell says most people don’t realize Canada Post is a profitable Crown Corporation that does not depend on tax subsidies. 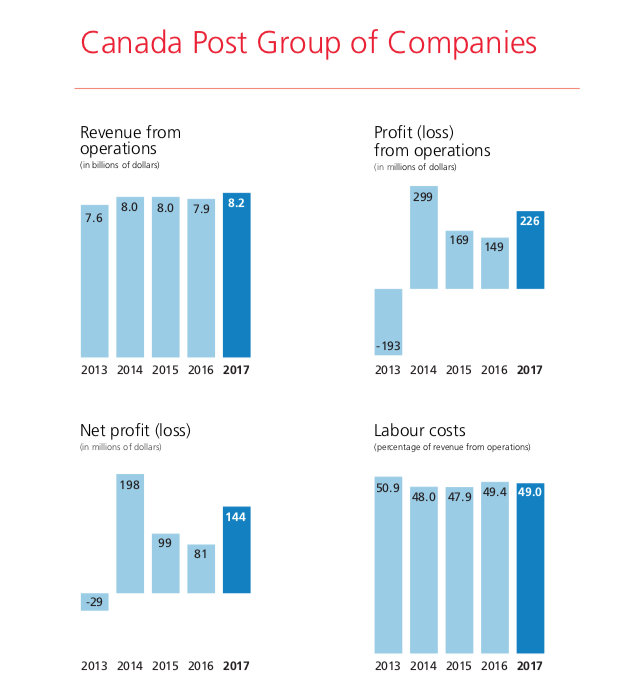 The Corporation’s latest annual report shows that in the last five years, the Canada Post Group of Companies has made a net profit every year except 2013. This entry was posted in Town of Sackville and tagged Canada Post, Canadian Union of Postal Workers, CUPW Moncton local president, Linda Campbell, rotating srikes. Bookmark the permalink. Good luck for a fast and satisfactory resolution! I hope that the employees are not paid through the Phoenix system in addition to the issues of conflict 😊. I personally think that Canada can eventually maybe consider moving from a Crown monopoly system to another system. I can cite one model that seems to be working well (many publications by researchers and business reporters). It is LibanPost (the Lebanese mailing system) with its gradual public-private partnership. I find it interesting, and maybe even ironic, that the Lebanese Government partnered with Canada Post after tender (along with SNC-Lavalin from Québec) to revive LibanPost from ashes after the end of civil war. The Lebanese Government could not afford the financial burden of a reform of bureaucratic procedures. They made the strategic decision to gradually privatize (rather than a systematic abrupt change). SNC Lavalin did some good work along and left on good terms. Lebanon Invest (from Banque Audi) is now the shareholder instead (66 percent stake in LibanPost). I believe Post Canada stayed as a partner although the company belongs to groups M1 and Saradar since 2012. Canada Post did an excellent job that Lebanese citizens appreciate. I am sure it can re-invent itself domestically too, hopefully with justice to all! It seems to me that a HUGE problem of Canada Post is that they’re mismanaged. It almost feels as if there’s an unstated goal of killing them off. Let me explain: the lettermail business is dying. Online commerce, however, is massively increasing package deliveries. Why is Canada Post practically excluding itself from the package business? That’s what I’d like to know. 500 grams of lettermail is fairly affordable. 500 grams of parcel mail (unless it happens to fit within lettermail thickness limits) is much more expensive. This makes no sense, as total volume and weight should be the determinants. Not only that, but it’s often more expensive to ship within Canada than to ship from a foreign country to Canada. Or in some cases from Canada to the U.S.A. (“small packet”). It’s also often more expensive to use Canada Post’s parcel offerings than to courier the same parcel. There is, to me, clearly a market for “slow and steady” parcels, as opposed to the usual “rush courier” offerings. Canada Post could easily position itself into this market, which it fully has the infrastructure for, based on its (dying) lettermail business. That it isn’t doing so, in my opinion, is a sign that it is being killed. Either deliberately, or through complete incompetence. This strikes me as a much more serious issue than any union-management issues that the place may have, as it gets down to the fundamentals of their business model. It’s also very negative for Canada in general, as it discourages local electronic commerce in favour of cheaper-to-mail shipments from abroad!